We got audited. There’s always something they catch, right? But I actually appreciate the thoroughness of this audit, and I used its findings to learn a little about one of those mystery areas that never seemed to matter until now: ciphers. Now it matters because cipher weakness was the finding! I had an older piece of Nortel gear which was running SSL. The auditors found that it allows anonymous authentication ciphers. Have you ever heard of such a thing? I hadn’t either! I am far from an expert in this area, but I will attempt an explanation of the implication of this weakness which, by the way, was scored as a “high severity” – the highest on their scale in fact! The briefly stated reason in the finding is that it allows for a Man In the Middle (MITM) attack. I’ve given it some thought and I haven’t figured out what the core issue is. The correct behaviour is for a client to authenticate a server in an SSL session, usually using RSA. If no authentication occurs, a MITM SSL server could be inserted in between client and server, or so they say. So in this case it is successful, though it has chosen a different cipher from Nortel, namely RC4-SHA. But we can look it up and see that it’s a cipher which uses RSA authentication. Cool. Pardon me? It turns out there are cipher groupings denoted by aliases, and you can combine the aliases into a cipher list.
! – permanently deletes the cipher from the list. providing assurance that aNULL and eNULL are cipher families understood and supported by openssl, and that I have done the hardening correctly! Note the protocol says SSLv3 and not TLS. OK, yes, RC4 is a discredited cipher so disable that as well. Most clients (but not all) will be able to work with a server which is set like this. I now get an “A-” and am not supporting any weak ciphers! Yeah! It’s because those configuration lines mean that I explicitly don’t permit SSLv2/v3 or the weak RC4 cipher. I need to study to determine if I should support TLSv1.2 and forward secrecy to go to the best possible score – an “A.” (Months later) Well now I do get an A and I’m not exactly sure why the improved score. 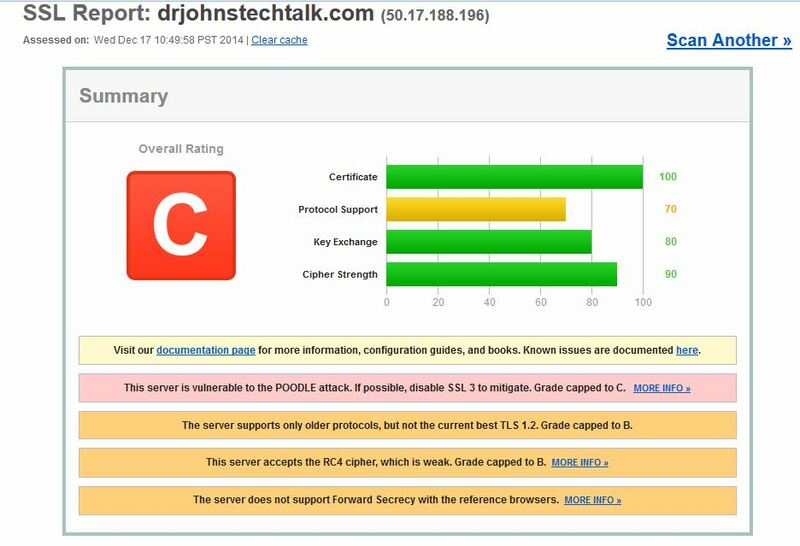 After all the above measures the Digicert certificate inspector I am evaluating says my drjohnstechtalk site is vulnerable to the Breach attack. From my reading the only practical solution, at least for my case, is to upgrade from apache 2.2 to apache 2.4. Hence the Herculean efforts to compile apache 2.4 as detailed in this blog post. My preliminary finding is that without changing the SSL configuration at all apache 2.4 does not show a vulnerability to BREACH. But upon digging further, it has to do with the absence of the use of compression in apache 2.4 and I’m not yet sure why it isn’t being used! I was going to check to see if my current score at SSLLabs is an A-, and what I can do to boost it to an A. Well, I got an F! I guess the lesson here is to conduct periodic tests. Things change! Now (11/11/16) my version is openssl-1.0.1e-48.el6_8.3. Would this upgrade suffice without any further action? Some background. I had compiled – with some difficulty – my own version of apache version 2.4: https://drjohnstechtalk.com/blog/2015/07/compiling-apache24-on-centos/. Simply installing these new openssl libraries did not do the trick immediately. So the next step was to restart apache. Believe it or not, that did it! Going back to the full ssllabs test, I currently get a solid A. Yeah! In the spirit of let’s learn something here beyond what the immediate problem requires, I learned then that indeed the openssl libraries were dynamically linked to my apache version. Moreover, I learned that dynamic linking, despite the name, still has a static aspect. The shared object library must be read in at process creation time and perhaps only occasionally re-read afterwards. But it is not read with every single invocation, which I suppose makes sense form a performance point-of-view. Your best bet is the SSLLABS.com web site. Go to Test my Browser. University of Hannover offers this site. Just go this page. But lately I noticed that it does not list ciphers using CBC whereas the SSLlabs site does. So SSLlabs provides a more accurate answer. I tried to give the owners of e1st.smapply.org a hard time for supporting such a limited set of ciphersuites – essentially only the latest thing (which you can see yourself by running it through sslabs.com): TLS_ECDHE_RSA_WITH_AES_256_GCM_SHA384. If I run this through SSL interception on a Symantec proxy with an older image, 6.5.10.4 from June, 2017, that ciphersuite isn’t present! I had to upgrade to 6.5.10.7 from October 2017, then it was fine. But getting back to the rationale, they told me they have future-proofed their site for the new requirements of PCI and they would not budge and support other ciphersuites (forcing me to upgrade). Another site in that same situation is https://shop-us.bestunion.com/. I don’t know if it’s a misconception on the part of the site administrators or if they’re onto something. I’ll know more when I update my own PCI site to meet the latest requirements. As you see from the above openssl is a very useful tool, and there’s lots more you can do with it. Some of my favorite openssl commands are documented in this blog post. A great site for testing the strength of any web site’s SSL setup, vulnerability to POODLE, etc is this Qualys SSL Labs testing site. No obnoxious ads either. Another one is https://sslanalyzer.comodoca.com/ SSLlabs seems much more complete, but it only works on web sites running on the default port 443. The Comodo CA tester will work on any URL, including ones that use ports other than 443. An excellent article explaining in technical terms what the problem with SSLv3 actually is is posted by, who else, Paul Ducklin the Sophos NakedSecurity blogger. The Digicert certificate inspector includes a vulnerability assessment as well. It seems useful. Want a readily understandable explanation of what CBC (Cipher Block Chaining) means? It isn’t too hard to understand. This is an excellent article from Sophos’ Paul Ducklin. It also explains the Sweet32 attack. A fast dedicated test for CVE-2016-2107, the oracle padding vulnerability: https://filippo.io/CVE-2016-2107/. SSLlabs test is more thorough – it checks for everything – but much slower. Aimed at F5 admins, but a really good review for anyone about sipher suites, SSL vs TLS and all that is this F5 document. I recommend it for anyone getting started. We now have some idea of what those kooky cipher strings actually mean and our eyes don’t gloss over when we encounter them! Plus, we have made our Nortel gear more secure by deploying a cipher string which disallows anonymous authentication. It seems SSL exploits have been discovered at reliable pace since this article was first published. It’s best to check your servers running SSL at least twice a year or better every quarter using the SSLlabs tool. This entry was posted in Admin, Apache, IT Operational Excellence, Security and tagged 3DES, aNULL, BREACH, CBC, cipher, Cipher Block Chaining, Comodo CA, F5 BigIP, man in the middle, Nortel, openssl, OpenSSL Padding Oracle Vulnerability, PCI, POODLE, Qualys, RC4, SSL, SSL Interception, SSLlabs, Sweet32. Bookmark the permalink. Wonderful article, helped me a lot! I am facing the same issue on Nortel Alteon SSL. Great explanation, bravo ! THANKS! Glad my efforts proved helpful to someone else. I hadn’t realized that this post had become mildly popular until I saw your comment. I took the opportunity to improve the formatting a bit. Really helpful article – about the only resource I’ve been able to find that explains these concepts for normal people! Great article but I’m still missing one thing – I get the impression that with the openssl command one can permanently delete ciphers from the ones supported or even change their order, but nothing I try seems to work. and leave a space after the ! but when I then list my ciphers nothing has changed. I thought this permanently removes ciphers from the list. Or doesn’t it? Is there some other way to change the ciphers on the client side? Being toply ignorant on cipher suites, i got a basic idea wat it is. Thanks you very much. I searched in the list obtained from command “openssl ciphers -v” and this particular combination is not available in that list. So please tell what should i do to make my application recognize the apache 24 this combi ciphersuite and process the records. It will be greatly helpful if you can reply me as early as possible. I’m great at debugging such problems, but only when I have full access to all systems involved. Quick fix advice is easy to dispense and usually wrong. I’m not a fan of the quick fix. When I encounter a problem I dive deep until I emerge with a fix, as you can see from reading my posts. I got the problem solved. I modified the http-ssl.conf file to point only one ciphersuite which i want. then when i hit the page from ie, server hello in wireshark shows the ciphersuite which i want. then my app is able to recognize that on tls1.1 protocol and decode the same. Thank you so much for this posting. I read several articles on this today, and yours was the most useful! I try to test allowed ciphers but it doesn’t seem to work. For example, I try to allow only very strong ciphers like AES-256. With IE7+XP SP3, I manage to reach an HTTPS page with only RC4 128 cipher !?! best article on Cipher !!! Lot of scope for addition as its 2017 now. hello my question is if i can add a new permitted cipher strings by myself in openssl or i can just use the existing ones? ?